With the invention of airplanes, we are sometimes so preoccupied with exploring distinct parts of the world, that we forget those fascinating places much closer to home. Back in my granddad’s age, holidays were more about heading down to the Isle of White or cruising to the West Country in a caravan. Needless to say, things have changed. However, with the economic crisis engulfing the current world, there’s no reason why you can’t simply save a bit of money and head somewhere in Britain where you’ve never been before. Here are a few must visit places in the United Kingdom. We’ll start with one of the already mentioned, as its appeal has seemed to unjustifiably decline over recent years. The Isle of White is just the perfect family holiday. An island filled with natural beauty and a serene peaceful vibe, it’s no wonder our parents and grandparents travelled out there so much. A trip to Carisbrooke Castle should then be a necessity. This is where King Charles I spent two years prior to being executed. Zoos and holidays are just the perfect combination. A visit to the Amazon World Zoo Park will confirm this. With a plethora of different animals and attractions, this stop will provide those belonging to all age groups the perfect time. Ventnor Botanic Gardens is a must see natural wonder. It’s sometimes ignorantly thought that there aren’t many natural must sees in the United Kingdom; however the dazzling beauty on display at Ventnor will dispel such myth. Not surprisingly I’m convinced that merely flicking through an Eastbourne holiday guide will convince you to take a trip here. 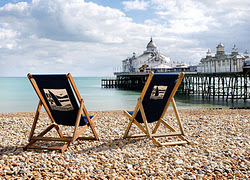 Within the historic county of East Sussex, this large town is the perfect getaway destination. The first step that warrants mentioning is Fort Fun. Now this is a place that’s actually only for the young, however if you’re young hearted you’ll no doubt enjoy it too. Who doesn’t like amusement parks? Another one for the kids is Treasure Island theme park: a destination full of adventure, and a blend of indoor and outdoor attractions. Perhaps you’ve now gotten an idea of what Eastbourne’s all about. It is really tailored for families with young children but that’s why it’s such a great holiday destination. It wouldn’t be a list of British holiday attractions without mentioning Cornwall would it? The list of what you can do in Cornwall is endless. From the infamous Land’s End, to the Geevor Tin Mine museum, displaying the region’s mining heritage, Cornwall is a delight for a peaceful family trip away. The world famous and cliff top Minack Theatre also warrants mention. Whether you want to watch a show or simply visit the place due to its spectacular views and incredible location, no trip to Cornwall can be made without stopping by Minack Theatre. The wildlife sanctuary Paradise Park is literally a paradise park – excuse the pun. Including a JungleBarn indoor playing centre, it’s perfect for family trips.